Stale air and foul odors have met their match with Chemical Guys Zesty Lemon Lime! This combination air freshener and odor eliminator replaces old food smells, body odors, cooking fumes, and musty air conditioning funk with the tangy zing of fresh-cut lemons and limes. The crisp citrus overtones freshen the air while active odor enzymes permanently eliminate foul odors at their source. A few spritzes of Zesty Lemon Lime replaces foul odors with pleasant scents, and helps prevent bad smells from popping up in the future. Refresh the air in any car, truck, SUV, or RV as part of an interior detail. Eliminate moldy and mildewy odors blowing from air conditioning vents with Zesty Lemon Lime as part of an AC system flush. Use Zesty Lemon Lime for fresh air in any enclosed space, like automobiles, homes, offices, locker rooms, and any other place that could use a fresh clean scent. Upgrade your air freshener palette and choose the invigorating and refreshing scent of Chemical Guys Zesty Lemon Lime Air Freshener & Odor Eliminator. Unlike cheap car wash air freshener scents, Chemical Guys Zesty Lemon Lime goes the distance. Any run of the mill air freshener maker can synthesize a crude citrus scent, but only Chemical Guys blends Zesty Lemon Lime with citrus fruit extracts for an authentic citrus essence experience. Chemical Guys brews every premium air freshener and odor eliminator with natural ingredients, refined essential oils, and water-based bases that won 't stain fabrics or leave sticky residues inside the car. Air freshener cartridges and cans can last a while but they take up space inside the car, and they 're eyesores! The refined scents and odor elimination enzymes work long after. One spray of Zesty Lemon Lime works for weeks on end and takes up no more room than the air space inside the cabin. Save space, and enjoy the space inside your car with the refreshing scent of fresh citrus and Chemical Guys Zesty Lemon Lime Air Freshener. Chemical Guys engineered Zesty Lemon Lime Air Freshener with active odor eliminators and neutralizers to rapidly subdue undesirable smells right at the source. Zesty Lemon Lime Scent pleases the senses with the zesty scent of lemon and lime. 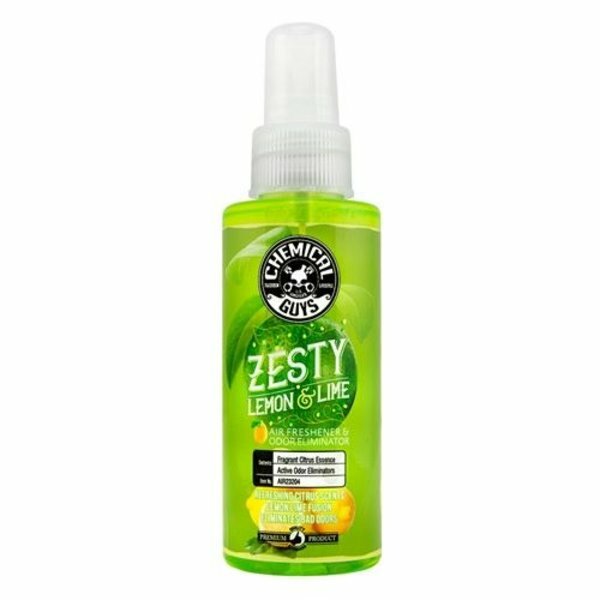 Zesty Lemon Lime Air Freshener is enriched with clean overtones, delivering a fresh scent that lasts weeks, not days. One spray is all you need for a full size vehicle. Enjoy the zest of lemon and lime everyday with Zesty Lemon Lime Air Freshener and Odor Eliminator. 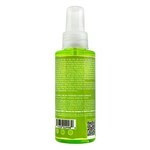 Zesty Lemon Lime Premium Air Freshener & Odor Eliminator is available in 16 ounce size.